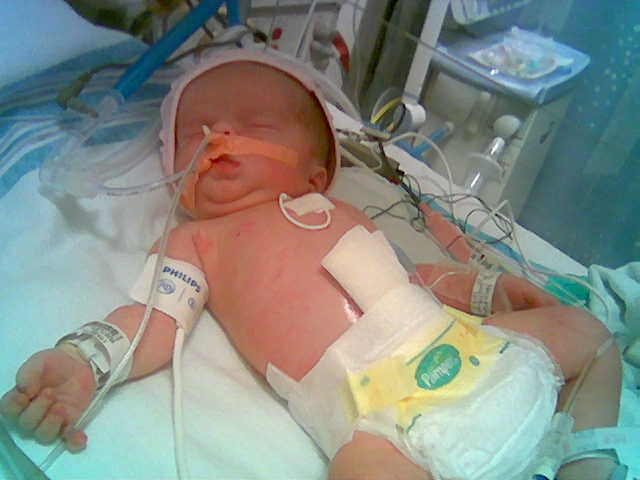 They were able to repair the gastroschisis in a single operation (primary closure). She is sleeping from the pain medicine and is doing very well indeed! I am in the room with her and will sleep here tonight. Thank God for family centered care and also for free high speed wireless internet in the hospital. Tomorrow the neurosurgeons will be by for a consult on the hydrocephalus. Father Val from Jess's parish just came by, too. Sweet! I am glad she is doing well indeed. Oh, those little hands! Alicia, glad you were able to post the pix to the blog. Looks better here than it did on the phone. Although I forwarded the pix to about 6 other phones. Glad to hear that Fr Val made it by! The Grand-auntie is passing the info on to the Grand-uncles on my side. "So I can call you GRANDPA now" Strange how that sounds right now. I left additional messages for the boys that all went well. Oh, Grandma Alicia, she's BEAUTIFUL! Sigh. Congratulations to J, and to you! I'm so glad the surgery went well too. She is so beautiful! Is that red hair??!! I am glad everything is going so good. Hope *your* baby is doing ok. It must be hard for her not to be with Emma. May God grant all of you many years! Congratulations on the birth of your grandchild! I am so pleased and relieved that things are going so well. Well done, to your daughter on delivering such a beautiful baby. You all continue to be in my prayers. Congrats to you & yours Alicia! My brother & sister-in-law had a wee one that required an operation upon birth and it was nerve-racking. Welcome to the world, little one! She is precious! Sending prayers that future procedures are as smooth as the first. Congratulations, and welcome to the wonderful world of grandmothering! Praying that all will continue to go well. Congratulations! What a beautiful girl!!! I'll continue to keep her in my prayers. She looks just beautiful! What a great, great blessing that you can be there with her now. Continued prayers! Congrats, Grandma. Continuing to pray. What a beautiful baby! Thanks for posting the picture. I'm very glad the surgery was successful. We'll continue to pray for her. She's beautiful!! You are all in my constant prayers. Congratulations and much love to Emma, Jess, proud grandparents, and all the family. This page contains a single entry by alicia published on June 20, 2007 8:46 PM. baby is here was the previous entry in this blog. extubated! is the next entry in this blog.